We believe this to be the closest simulation of Wersi and Hammond Organs available for any Technics keyboard. Drawbar settings are also included for Klaus Wunderlich. File 1 for Drawbar organs has 60 panel memories set to emulate Wersi, Hammond and Tab Organs plus twenty more set to traditional Drawbar shapes. Forty sound memories and a 5/4 jazz rhythm. 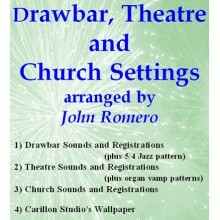 File 2 contains 50 panel memories for Theatre Organ settings which include 3/4, 4/4 and 6/8 vamp rhythms in the composer. File 4 is an added bonus file of the Carillon Studios Wallpaper. In total this disk contains 128 registrations (all named), 4 extra styles,105 custom built sounds, 4 patterns and 6MSP’s.